Several large natural gas interstate pipeline projects have come online in recent years to support the shifting geography of domestic natural gas production. The Marcellus and Utica shale plays in the Northeast, where production has grown and resources are abundant, are major drivers for pipeline development. In 2016, the Federal Energy Regulatory Commission (FERC) certificated 17.6 billion cubic feet per day (Bcf/d) of new natural gas pipeline capacity. So far in 2017, FERC certificated more than 7 Bcf/d of new pipeline capacity before losing its quorum following the departure of one commissioner in February, which left just two sitting commissioners and three vacant seats. FERC oversees the interstate transmission of natural gas, which includes the regulation of interstate transportation rates and services for natural gas pipelines, natural gas pipeline construction, and related pipeline environmental matters. Pipeline certification involves reviewing applications for the construction and operation of natural gas pipelines and ensuring that applicants comply with safety standards. Receiving a certificate is just one step in the process of building and operating a new pipeline; pipelines receiving certification in 2017 will not necessarily come online in 2017. The seven projects certificated during the first few weeks of 2017 include more than 1,500 miles of natural gas pipeline construction and expansions, involving combined additions of more than 7 Bcf/d of capacity. The pipeline projects are concentrated in the eastern half of the United States to improve access to markets for growing eastern natural gas production, and they have projected 2017 and 2018 in-service dates. 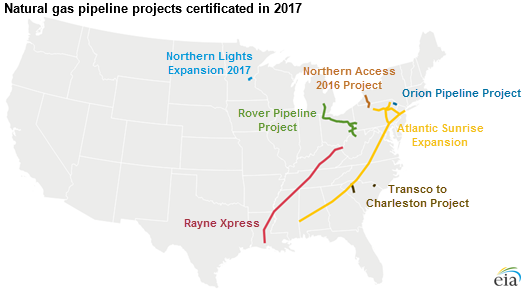 Two large-capacity projects, the Rover Pipeline Project (and related projects) and the Atlantic Sunrise Pipeline Project, were among those that received certificates in early 2017. The Rover Pipeline will move natural gas out of the Utica shale play that spans parts of New York, Pennsylvania, West Virginia, and Ohio. According to Rover Pipeline LLC, the $4.2 billion project will have direct deliveries in Ohio; West Virginia; Michigan; and Ontario, Canada and will reach a capacity of 3.3 Bcf/d. Construction will begin in the first quarter of 2017. The Atlantic Sunrise Pipeline will move natural gas out of the Marcellus shale play to markets in the mid-Atlantic and southeastern states. According to the Transcontinental Gas Pipe Line Company, LLC, the $2.6 billion expansion will add 1.7 Bcf/d of pipeline capacity, and construction will begin in mid-2017. Other recently certificated pipeline projects include the Orion Project, Transco to Charleston Project, Rayne and Leach Xpress, Northern Access, and Northern Lights 2017 Expansion. As of February 23, 33 projects had FERC applications in process, and 20 projects had submitted FERC pre-filings, according to data from PointLogic Energy. Consideration of these projects, among others, will be deferred until FERC has at least the three commissioners required to constitute a quorum.